There’s a guy in my office that works with a man called Jesus. I’ve heard it countless times but each time I think, I love that he cares so much, what Jesus thinks. 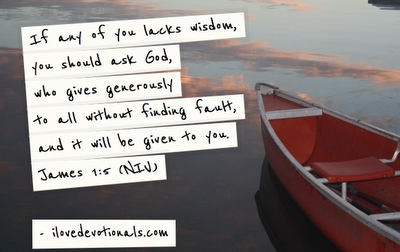 And it makes me wonder if maybe this is what James meant when he said to ask God if any of us lack wisdom. To be clear I don’t think James wanted us to stop and make a big thing about asking Jesus for wisdom. I suspect James just wanted it be a natural part of who we are. Perhaps a bit like breathing: simple, unconscious and something we can’t live without. Maybe a little like my colleague who without thinking checks with Jesus. Every time I hear, “When Jesus tells me what he thinks I’ll let you know”, I’m challenged because I’d like to have that kind of relationship with Jesus, (the Jesus who died and rose again for us, not the Jesus who works with the guy in the office). I’d love it to be that easy and acceptable to just tell someone, “I’ll let you know what Jesus thinks…” and for them not to raise their eyebrows or think, “religious freak”. And I wish that I was that in tune with Jesus that before I did anything I thought, “let me check with Jesus”. And I wonder what stops us from checking in with Jesus throughout the day. For me, it is often embarrassment, or fear of what others might think, but what is it for you? 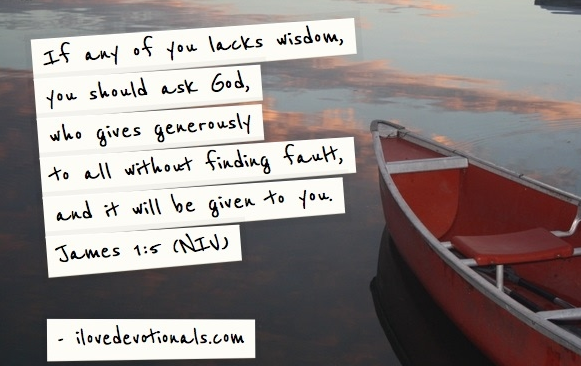 How can you make seeking God’s wisdom a more normal part of your life? I’d love to hear your thoughts on this devotional via a comment below or if you enjoyed this post why not tweet it or subscribe to have each new devotional emailed to you. What Is God Trying To Show Me?